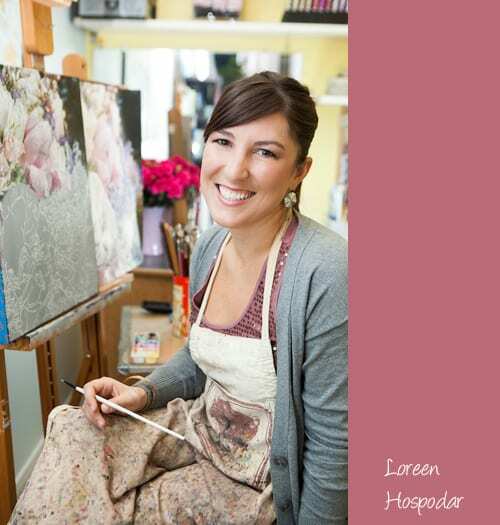 This week on Wedding Wednesday, I’m delighted to feature an interview with artist Loreen Hospodar of Reenie Rose, who specialises in painting bridal bouquets. Like many entrepreneurial businesses, Reenie Rose was more of a happenstance than a drawn out desire to start my own business…especially during an economic decline. In 2008, a family friend who had purchased artwork from me in the past asked if I would paint something for her niece as a wedding gift. After brainstorming a bit, we decided that a painting of the bride’s bouquet would be perfect since I had always gravitated towards painting natural objects. Upon completion of the painting, we both stood back from it and realized that this painting was more than just a painting….it was an idea, and not one that many had discovered. At the beginning of 2009, I officially started Reenie Rose in Chicago as an alternative option to traditional bridal bouquet preservation and have been wonderfully embraced by my wedding industry peers, both locally and worldwide. What made you decide to concentrate on painting bridal bouquets? After completing that first bouquet painting, I did some research. I found that the options for bouquet preservation were terribly out of date and that there was in fact this great niche in the wedding industry. 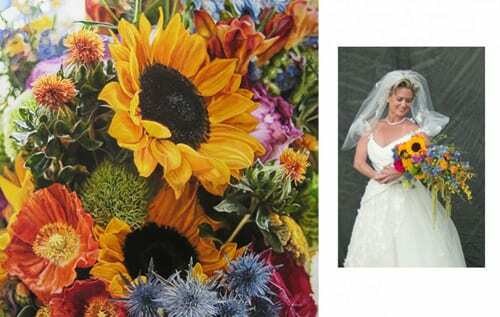 Keeping a focus on bridal bouquets allows me to really direct my marketing efforts and separate myself from everyone and their mother who likes to paint flowers. The honest truth is that I’m not reinventing the wheel here. Flowers have been painted for centuries. But what I can provide with Reenie Rose is a timeless painting of flowers, infused with a whole layer of memories, meaning and personal history. Could you tell us about the process? Having a custom painting created is quite a simple process whether the wedding is in the future or has passed, is near or far, since I work from high resolution digital images. Once I receive the order form and deposit from a client, I’m in touch with both the florist and the photographer to either take my own photos or receive images from the professionals. If it’s a local wedding, I like to go take the photos myself the day before the wedding at the florist’s to be sure I have a zillion images of every angle of the bouquet. If the wedding is out of town or has since passed, the photographer helps me out with images from their collection. From these images, I compile several different compositions based on the painting size for the client to choose from. Once a composition is chosen, a painting generally takes 6-12 weeks to complete and anywhere from 35-65 hours of painting time. Voila! You have a timeless piece of art! My recently updated website makes getting a painting even easier now with my new registry feature. A couple can create a painting registry for friends and family to be a part of, thus further defining the painting as a family heirloom. I also encourage friends and family looking to purchase a painting as a group gift to use the registry as a platform and organizational tool for getting in touch with all who are to be involved in the perfect gift. This year is shaping up to be a very busy one. We’re in event season/planning right now, so I currently have a handful of events that I’m very excited about participating in. I’m co-hosting a wonderfully creative event called FORM: Art + Floral where we pair up florists with artists. This year’s show, titled CMYK, has the florists create a colorful floral creation based on their interpretation of the piece of black and white art they are given for inspiration. It’s a wonderful collaboration of both fields of interest for me, art and flowers, and taps into an evening that appeals to a wide scope of viewers…from the wedding industry to the illustrious art world. I currently have a handful of paintings in the queue keeping me busy, and some of which I will be painting live at this event. I always encourage viewers to come and see me paint in person since it helps give a better explanation of what I do as an artist. My video also illustrates this in a lovely way. Reenie Rose from Reenie Rose on Vimeo. Because I love all things wedding, I also dabble in day of wedding assistance and have about 20 weddings already booked this year. Working a wedding allows me to step away from the easel and work with all the fabulous people in this industry who I’ve grown to truly admire. In between painting and wedding assistance, I have a couple of mini projects here and there that further stretch my creative talents and are featured on the Reeniebeans section of my website. I love staying on my toes with creative challenges and using my skills for so many other purposes. My favorite flower is the one given to me as a gift. There’s nothing like receiving fresh flowers as a thoughtful gesture! I’m forever in awe of the beautiful little intricacies that some species possess and how they are pieces of art all by themselves…like orchids, scabiosa, veronica, protea, cornflowers and garden roses. Ok, I love garden roses…it’s fitting with my business name. These flowers also tend to be the ones that are the most challenging to paint, but relinquish the greatest reward visually. Thank you so much to Loreen for all her help in compiling today’s blog post. She sounds one very busy lady with all her creative projects! If you’d like to keep up-to-date with Loreen’s news, she’s on Twitter and Facebook. These paintings are absolutely beautiful.. thankyou so much Rona and Loreen for sharing them. Thank you Lisa. You’re very welcome :-). Huge THANK YOU to Rona for the feature!!!! And, Lisa, thank you for your lovely comment. You’re very welcome Loreen :-).